I was thinking today, “If we’re going to have a ridge of high pressure move through here, we might as well have sunshine too!” That’s not how our Dear Mother Nature works in Washington. In fact, I heard someone comment that our current weather “is like someone hanging a large dripping wet cloth over our heads”. I actually became very fond of that simile! It describes the upcoming weather pattern nicely. Kitsap County has a wide variety of elevation so pinpointing exact cloud coverage for every location will be time consuming, but just note that if you are a good 700-1,000′ up (if you don’t know your elevation, click here) the odds are greater of getting into the sun. Because of the wide variety of weather, the 7 day is, once again, an average of two extremes: higher elevations like Green and Gold Mountain areas getting into the sunshine and mild temperatures (low and mid 50s) while locations near the water like downtown Silverdale/Bremerton will be socked in the low clouds/fog/drizzle with high temperatures in the upper 30s and lower 40s. It is certainly going to be a rollercoaster ride if you decide to go hiking on Gold/Green Mountain one morning and then go to Silver City for lunch. Just bring a heavy jacket and shorts along for the ride! The forecast remains similar throughout the rest of the 7 day: fog/mist/low clouds at low elevations while the higher elevations will see sun and mild temperatures into the 50s. I’m not saying sunbreaks are going to be nil below 700′, they’re just going to be a bonus! Again, this displays our micro climates very well here! P.S. Feel free to comment on your sky conditions over the next couple of days. I’d like to see some lower elevations get into the sun! I realize I am not a professional meteorologist, but I am still held responsible for “forecasts gone wrong” in the community. It is bundles of fun trying to explain why my school district didn’t see a snow day when it was supposed to happen, or why it rained on a day that was supposed to be dry (sound familair?). But of course, each day is a new day to strive for better accuracy and make sure to warn the public 24 hours in advance before inclement weather. 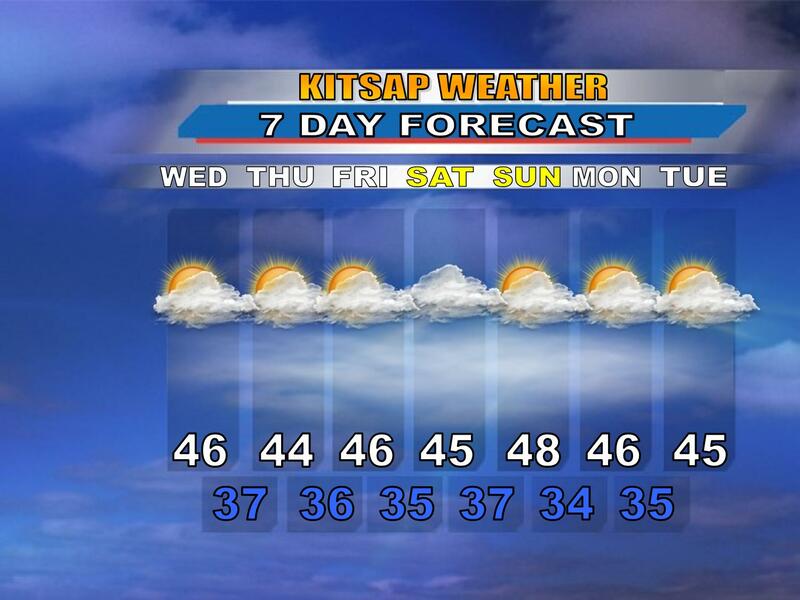 Well, this segment is called: “Forecasting Kitsap” and this is the time where I share some experiences (both positive and negative) forecasting here in Kitsap County. What better way to start this segment than to use today as an example! I woke up at 5:00 am this morning—right on the button. I walked downstairs, ate my breakfast, and then did all the things people do in the morning. Before I was about to leave the house, I ran up to my room to get something. As I looked around my room thinking, “How could my room get THIS disasterous in only four days? !” I heard the gutters outside my house dripping. I paused and stopped breathing to make sure I was really hearing what I thought I heard. Yup, it was raining outside and I didn’t even see it coming. I was still in denial as I yanked the window open and let the raindrops fall on my hand. My heart sank, “Well, dang it!” I said. “Another forecast down the drain…” I am assuming this is a feeling many weathermen share: waking up in the morning, looking outside, and seeing their partly sunny turn into 6 inches of snow. And then I realized that the rain made some sense. In “high pressure” situations, the atmosphere likes to squeeze out the last remaining moisture available before drying out, kind of like squeezing out all the water from a sponge after using it. I thought that last “squeeze” was Sunday, when it was showery/cloudy all day. But nope! Mother Nature is giving us one last “Hoorah!” with rain before we *finally* (knock on wood) dry out. Because the clearing didn’t occur as planned last night, fog wasn’t a huge issue. I guess that’s a plus. However, it should remain generally cloudy today, though I am not cancelling some sunbreaks. Highs will get into the mid to upper 40s. Now here’s where things are looking to change compared to previous thoughts this week. Through Friday we are looking…well, cloudy but relatively dry save for some misty mornings. Latest models suggest cloud cover hanging on to the southern and eastern portions on the Kitsap Peninsula longer than the northern and western. Regardless, I think we’re all going to have a hard time breaking out into the sunshine, and if we do it’ll be a bonus. Highs will be near 50 due to the cloud cover. In fact, the clouds have helped trap the warmer air around the area, deleting frost potential…for now. The weekend looks nicer and sunnier, but then again that’s what we were thinking about this week just a few days ago and look what happened! All the more reason to stay tuned!